On the way to our third waterfalls, my mom surrendered and told us that we carry on without her. She wasn’t into hiking, like me, and wasn’t fascinated much on natural wonders. She loves shopping and would trade a day of going around Bali to shopping in Ubud. So there we were; my buddy, his mom and I, climbing down the steep stairwell waiting to be amazed on yet another waterfall adventure. 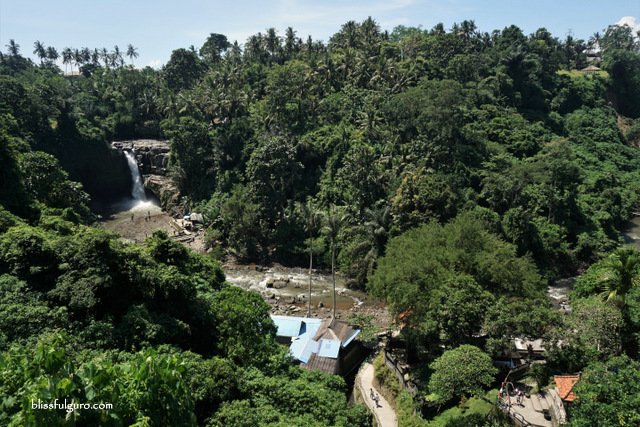 It isn’t as popular as the famous temples in Bali but we included some waterfalls on our itinerary to somehow see a different side of Bali that we failed to visit before. I wasn’t expecting a Niagara Falls-kind but just like Balinese temples, they have unique features that are definitely worth your time (check here for discounted tours, transportation and activities in Bali). Our annual two-month backpacking trip, which became a tradition for me and my buddy, has reached its fifth year already. As a public school teacher where we have forced leave during summer breaks, we always follow our wanderlust and discover more of ourselves as we go around the globe, or wherever our meager budget take us. It was last year when we started to show our moms our backpacking life by asking them to join on the Malaysia leg of our Same Same Summer Trip 2017. This year, we did the same thing on the Bali part of our SEA 2 Africa 2018 where we went to Bali, East Timor, Singapore and Morocco. It was during our ASEAN Summer Loop 2015 when we first explored Bali with some of our friends and returned in 2016 during the Trip of Wonders. This time, we had ten days to go around the famous island province in Indonesia and we’re showing our moms some of our favorite spots and those we missed during the first two trips. We had a private car with a fabulous English-speaking driver from Bali Golden Tour. 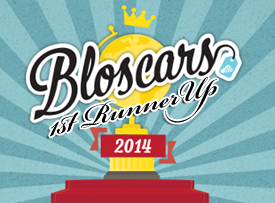 The company is one of the most-trusted tour companies in Bali and our favorite since our first Bali trip. 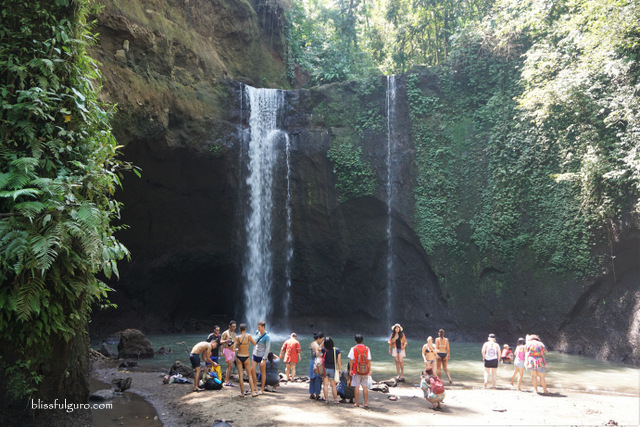 They have tailor-made trips for private and group tours but we wanted to choose the spots to cover so we customized everything which they obliged. Our driver, Putu, waited for us at the arrival hall of the airport and became our trusted friend for the next ten days. 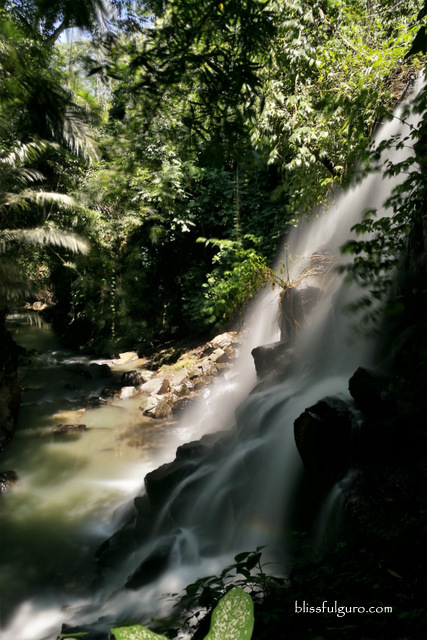 Our itinerary composed of a relaxing three-day staycation at SereS Springs Resort, exploring the temples of Bali, testing the waters and beaches of Bali, and shopping in Ubud for the moms. Me and my buddy haven’t been to any waterfall in Bali before so we’re excited to include six waterfalls on this trip. However, the strenuous hike down coupled with intense summer heat was pulling us down that we got to visit only three of those. It was weird that my buddy’s mom wasn’t showing any sign of beating unlike us, she’s 69 by the way. 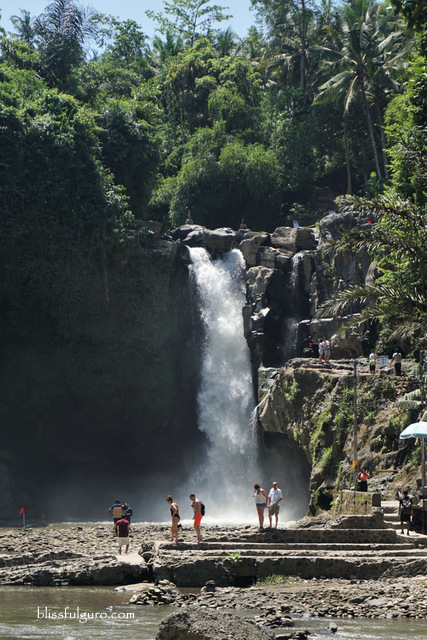 Judging from the number of restaurants and souvenir shops along the roadway, I knew that we’re heading to one of the famous waterfalls in Bali. 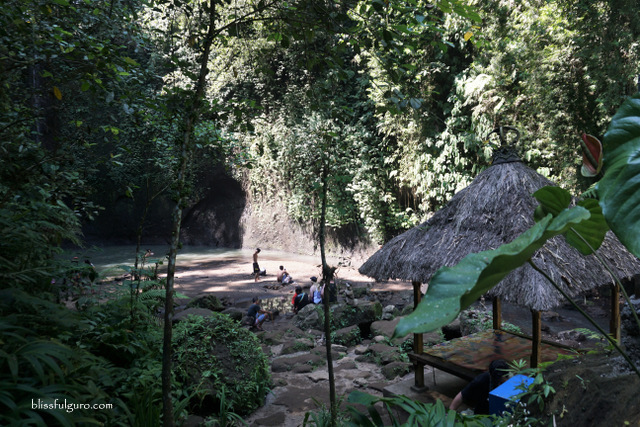 We found Tegenungan Waterfalls’ first viewpoint just a few meters right after the entryway. I would settle with this view but my buddy and his mom were so eager to hike down, my mom and I followed their lead. A few lookouts after and we reached the base of Tegenungan Waterfall. As expected, restaurants and shops were around the area. I was pleased with the view we had but my buddy and his mom went further to the plunge pool. My mom and I found a hut and stayed there as we waited for them—we’re lazy like that, I know. 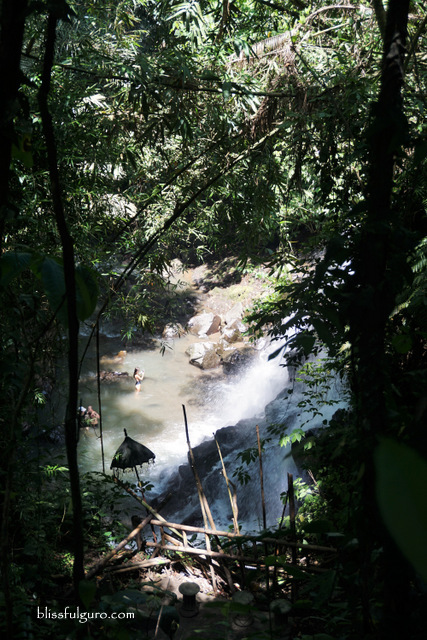 The next waterfall was a challenge ‘coz we almost got lost as Putu didn’t exactly know where Kanto Lampo Waterfall was as it’s not as famous as the first one. After paying the entrance fee, we were approached by a guide who’s willing to lead us to the base and promised to take gazillion of photos afterwards. We, of course, politely declined as this would usually entail an endless haggling for the fee right after and just went on with the hike down. We reached a viewpoint from the side that wasn’t actually the perfect spot to see the waterfalls in all its grandness. The problem was that, we had to follow the stream to have a better look at it. So we checked out if we could probably work our way into the front, but seeing some hunky guys struggling over the slippery rocks, we decided to just stay where we were and appreciated the tiered waterfalls from that standpoint. 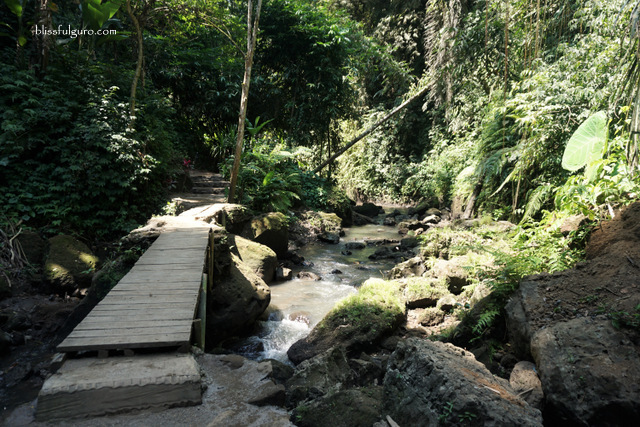 The path going to Tibumana Waterfall was beautiful. It started with golden rice fields then a downward path leading to a stream. At this point, my mom surrendered and motioned to quit, so we left her. We went through another stage of beautifully-manicured garden along the riverbed until we reached the end, literally, it was a dead-end. Tibumana Waterfall was beautiful. 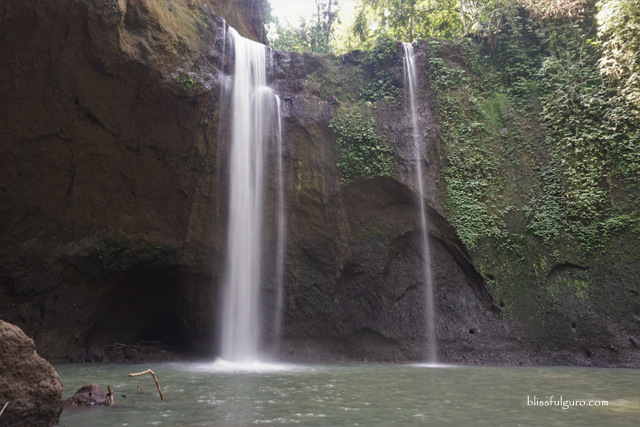 A cliff waterfall like what we’ve seen in Babuyan Islands, Philippines and Pakse, Laos. I wouldn't mind going back to these waterfalls next time and probably would pack a picnic lunch with us and test the waters. 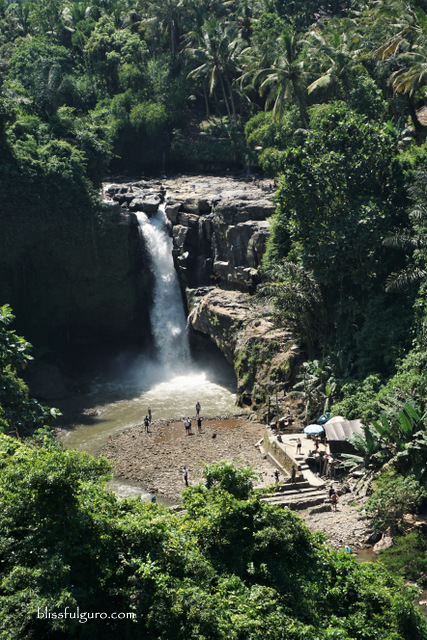 One thing's for sure though, you'll never get bored in Bali if you're an adventure-seeker and a nature-lover! 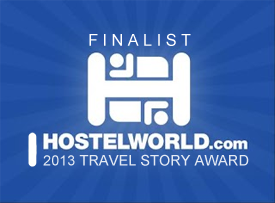 Check here for discounted Bali accommodations!